Those of us who are old enough to remember Wincobank when apostrophes like the above were not mere poetic hyperbole, and who are happily spared a sight of the ravages of city expansion, received a cruel shock when, a few months ago, at a meeting of the Board of Guardians, the Hall there was spoken of as in a state of desolation. Though not in itself a thing of beauty, it was beautiful for situation, and surely "grieving, if aught inanimate e'er grieves", its once embracing "woods, and all their echoes" now "mourn". It must not "sink unwept without the meed of some ....... tears" albeit unmelodious. In endeavouring to place on records what I have been able to gather as to the history of the Hall and its inhabitants, I begin with the latter. The family of Staniforth is, says the late Sir Alfred Scott Gatty, in his Ecclesfield Parish Registers, "one of the most ancient in this district; they derive their name from a small tenement called Staniforth (or Stanyford, mentioned in 1421: Wheat Charters pp 22, 27) "lying between Wincobank and Shiregreen". 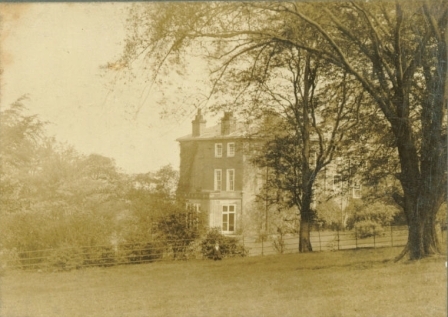 The family can be traced back for at least five generations to the time of Elizabeth, before we can establish a possible connection between it and Wincobank Hall. From its younger branch, which moved to Attercliffe, were descended two of Sheffield's leading surgeons, and several prosperous mercers. William Staniforth the elder, was on the staff of the Infirmary at its opening in 1797 and William, the younger, occupied the same position from 1820. Mr Hunter remarked of the senior William's pedigree: "Here are three generations of men filling up nearly two centuries, 1652-1834. Speaking in the reign of William IV, he could say, "My father's father was born in the time of the Commonwealth". It is, however with the elder line, which remained at the old homestead, that we are here concerned. It may be assumed with confidence that they were of the race of husbandmen cutlers, typical of the district, alternating the tilling of their fields with the fabrication of knives of riles in little off-shot smithies. A good specimen of the kind of habitation may be seen today at Bell-Houses, near by, whose owners, the Smiths, were themselves destined to representation among the inhabitants of Wincobank Hall. 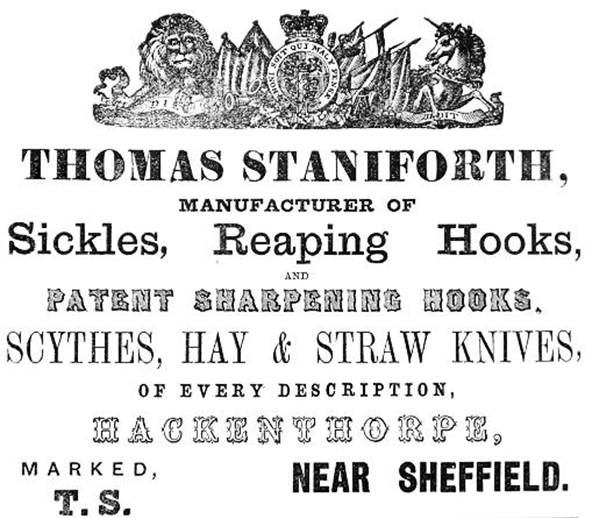 Whether the stay-at-home Staniforths became sufficiently prosperous to move from Stanyford to establish themselves where Wincobank Hall stands it is useless to conjecture; but we have the fact that the daughter of Jeremiah Staniforth who took out his cutler's freedom in 1699 because the wife of a certain John Browne, or Brown, of Sheffield, sometimes called a factor, more frequently "gentleman", or as in Hunter's pedigree, "of Wincobank and Sheffield, merchant". Did he "hang up his hat" in his wife's patrimony, or was the Hall, or what was destined to become the Hall, provided for her reception hard by her old home? Although he is not prominent in the annals of his time, John Browne was a man of some consideration, and if not exactly wealthy, well-to-do. He was one of the original trustees of Hollis's Hospital (1793); was elected a Town Trustee in 1713, and acted as Town Collector in 1720-21. It was at this time that the River Dun Navigation scheme for a canal to Tinsley was being vigorously pushed forward, and Mr Browne's £300 was among the larger loans advanced to finance the undertaking. There are in the Burgery Records items as to this loan, which may reasonably be interpreted as indicating that Mr Brown died, and his daughter Lydia married, in 1727. Then, just as Martha Staniforth had brought John Browne under the Wincobank roof, so her daughter Lydia Browne, inheriting it made it the next for a certain John Sparrow, who, through some unexplained migratory impulse winged his flight hither from London. I have not found him credited with any occupation not does he figure as taking part in the public affairs of the town. He is usually dubbed "gentleman" and since the structure of the Hall suggests the third quarter of the eighteenth century as its period of erection, or alteration, its present form may be reasonably ascribed, in the main, to him. In 1785, when he was 82 years of age, Mr Sparrow nominated a grandson, John Sparrow Stovin, child of his younger daughter to the chance of surviving all other entrants to the Tontine Inn lottery. He died in June 1789 and was buried at Ecclesfield His elder daughter and co-heiress, who had married Joseph Roberts, son of the Rev. Benjamin Roberts, formerly of Upper Chapel, was then a widow, and on her father's decease, Wincobank Hall passed, for the third time, as in the cases of her mother and grandmother, on the distaff side. This Roberts family was gradually dispersed, and the Hall was bought by Mr Jonathan Walker, of Ferham, as a residence for his mother and sister. Then in 1816, there came a further change, opening a new chapter in the history of Wincobank. About 1765 another immigrant from the south had found his way to Sheffield This was John Read, scion of a long line of yeoman farmers at Kilsby, Northamptonshire. He had served an apprenticeship in a chemical works at Bewdley, and he was accompanied here by his maternal uncle, Samuel Lucas. Together they established themselves as what was then called "sweep shelters" which meant refining the dust and fragments left by workers in the precious metals. Their premises in Green Lane became a veritable Tom Tiddler's ground, where gold and silver could be picked up in handfuls. It did not all stick to their fingers, but enough remained to enable Mr Read to retire in early middle-age to Norton House, and there to maintain a considerable establishment, taking his airing in an imposing carriage and pair, with a postilion, wearing a bright maroon livery, trimmed with a profusion of gold lace, crowned by a velvet jockey cap with gold tassel. Mr Read left his business in the hands of his two sons, Joseph and John, with the cousin, Samuel Lucas. It is with Joseph Read that this sketch is concerned, but in passing it may be noted that John Read, the younger, followed his father at Norton House, afterwards removing to Derwent Hall. But generous sacrifices made for others in misfortune prevented him from long enjoying that historic seat, and he died at Ryecroft, Abbeydale Road, in 1862, unmarried at the age of 86. When in 1800, Joseph Read, his elder brother, married a daughter of Mr Ebenezer Smith of Chesterfield (grandfather of the late Francis Ebenezer and Sydney Smith, of George Street), he, like his father before him, took his bride to the substantial house in Green Lane, adjoining the refinery. It was "large and handsome, of red brick with long sash windows in front, and a bow window at the side". Green Lane will not strike the modern reader as exactly the locality for a "desirable family residence" but with its iron palisades, it long survived aloof amid squalid surroundings, a pathetic relic of the days when it stood among the trees of a pleasant garden sloping down to the River Don. After the smelting works had been removed to their present site at Royds Mill, Mr Joseph Read followed them to reside there "in a pretty rambling sort of cottage, almost covered by a luxuriant vine". It stood amid green fields, and for it there was presently substituted a larger house destined at length to succumb to the smoke fiend - but not before, as we shall se it had provided a refuge to its builder in time of need. In the year 1816 Mr Joseph Read bought Wincobank Hall from Mr Jonathan Walker and removed there with his family. Its frontage, north, faced the road from Shire Green just above the bifurcation north-easterly by Meadow Hall to Rotherham and due east down the steep him to Brightside. Included in the purchase was a considerable acreage of agricultural land across the former of these roads, but "the Capital Messuage" itself, with its gardens and appurtenances, occupied little over an acre and a half. The evolution of the house was evidently from the east, where various outhouses, somewhat in the read, suggest the position of the humble germ whence it was developed into a narrow, two-storey building of stone, containing the kitchens; afterwards, but not long afterwards, continued by a deeper block with the same characteristics of masonry - rubble with larger quoin stones flush with the wall face. This part is of three storeys with sash windows surrounded by wooden architraves. Internally the room next the entrance, a later insertion, is panelled, and has an old dog-grate; and a room on the first floor where once was a similar grate. The large bay drawing-room window is an addition by Mr Read. The staircase is similar in detail to one remembered as having been in the "Iris" office, in the Hartshead, and similar examples may be still seen in the old Paradise Square houses. Mr J R Wigfull to whose kindness I am indebted for these details dates the house in the main as about 1770-80; certainly the latter half of the 18th Century. When Mr Joseph Read acquired the property, beyond removing a small old house and barns which had stood near its eastern end, he concerned himself more with a development of its outside amenities than with the structure itself. To this end, he bought from one John Fletcher, farmer, and from Henry Howard, Esq of Corby Castle, some acres of land reaching behind the house to Wincobank Wood, and below it to the ancient Ridgeway track leading past the prehistoric camp. And here he laid out gardens, and orchards, and pleasure grounds, encompassed with meadows and plantations, whose exceeding beauty was enhanced by the splendour of the distant landscape. As bearing on what has been earlier said respecting cutler farmers, it is worth noting that, among divers neighbouring small tenements, there stood on Mr Howard's land, and within fifty yards of the Hall, two cottages, with smithy and workshop. Unhappily Mr Joseph Read was not destined long to enjoy the pleasures of his charming estate. Before many years had passed clouds rolled over from the ironworks of his wife's relations at Chesterfield. By long endeavours to relieve their embarrassments, his resources were crippled, with injurious effects on his business, and what was worse on his health. Leaving the Wincobank he had so fondly cherished, he resumed residence at the Mills. But anxiety and disappointment killed him, and he died in 1837 aged 72. It was a reverberation of the same troubles that compelled his brother, Mr John Read to relinquish Derwent Hall. The story of the vicissitudes of fortune experienced in this family does not end, however, in sadness. Mr Read's second daughter, before her father's death had married Mr William Wilson of Sherwood Hall, Notts. 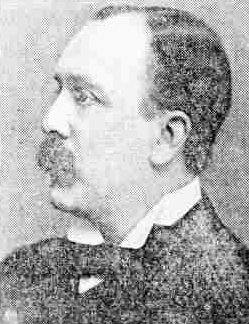 Their two sons, the late Mr Henry Joseph Wilson M.P. and Mr John Wycliffe Wilson, succeeded in course of time to the smelting business and restored it to far more than its original prosperity. They developed its scope and processes on a scale which to-day entitle it to rank among the romances of industry. Mr Read's eldest daughter, widowed after a very short married life by the death of her husband, Mr William Rawson, a Nottingham banker, returned to Sheffield, and discharging the liabilities resting on Wincobank Hall, recovered it as a residence for her mother, herself, and her sisters. There, while conducting a select boarding school, they abounded in good works for the benefit of their humbler neighbours. Their cultured refinement and philanthropic enthusiasm made their house a resort where many leaders of thought and action in literature, politics, and religion, were sure of a sympathetic welcome, and where crusaders against intemperance, and slavery, and heathenism, and the social evils that afflict mankind got rest and encouragement. An especially efficient passport to the hospitality of Wincobank Hall was persecution suffered by anti-slavery champions like George Thompson, Frederick Douglas, and William Lloyd Garrison, or anti-papal orators like Father Gavazzi, or anti-drink enthusiasts like John Ballantine Gough. It was Lloyd Garrison's influence that banished for ever wine from Wincobank table.